OK, so I’m a week late with this French Fridays with Dorie post. It’s a good thing, too, since I haven’t made this week’s Spiced Squash, Fennel, and Pear Soup yet. But there’s always tomorrow. Hope springs eternal in the Divine kitchen. This was a very simple recipe and was easy to throw together on a weeknight. 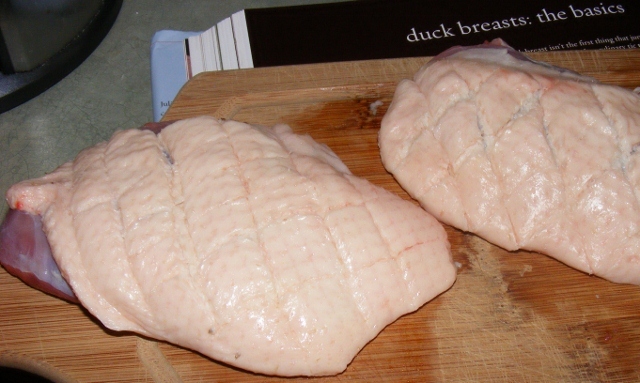 Some of the other FFwD members had a difficult time finding duck breasts, and some of them paid quite a bit for them (up to $20/lb) once they located them. Fortunately, I have a local farm that was processing ducks this week, so for $4/lb and a bit of butchering, I had duck legs for confit, offal, the neck and carcass for stock, and two beautiful breasts for this recipe. I scored the breasts to allow the fat to render as they cooked. After preheating the oven to 250°F and heating a dutch oven on the stovetop, I put the breasts, skin side down, in the pan. I cooked them for 8 minutes, then turned them over and cooked an additional 2 minutes. I realized when I turned them over that I should have cooked them slightly less time than the recipe called for, as the duck breasts were on the small side. I wrapped the duck breasts in foil and put them in the oven while I made the sauce, which consisted of duck fat, balsamic vinegar, honey, and lime juice. I cooked the sauce for a minute or two, then put the breasts in the pan and heated them on each side for about 30 seconds. I sliced the breasts on a cutting board, then drizzled some of the sauce on top. 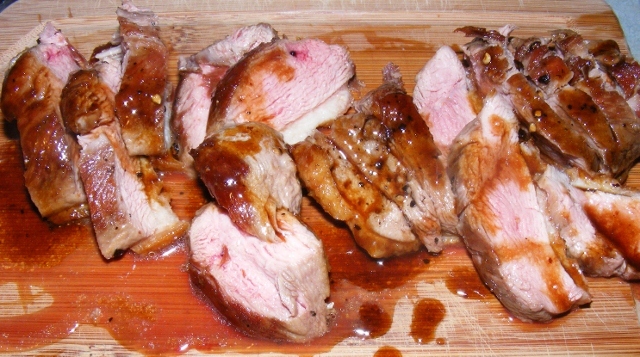 The duck breasts were slightly overcooked for my liking, but were still juicy, tender, and delicious. I tried a piece before plating, and ended up eating both duck breasts (with the help of A, who had already had dinner) directly from the cutting board. The meat was savory and not at all greasy, and the sauce was sweet, tangy, and slightly sour. 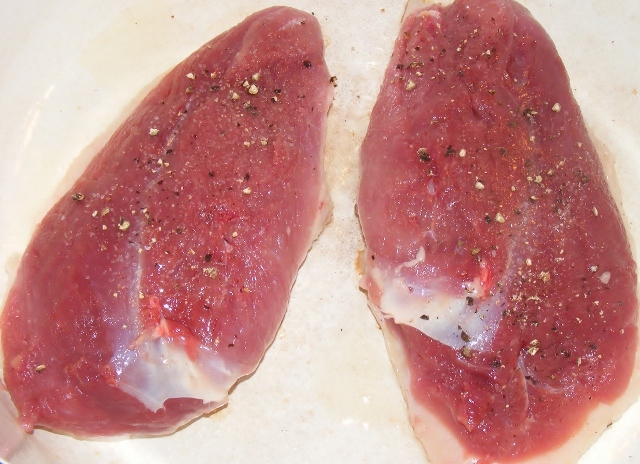 I could eat these duck breasts any night of the week. And since this is such a simple recipe, I’m sure I’ll be making them again soon. Eating right from the board – that’s right, give your dishwasher a break! 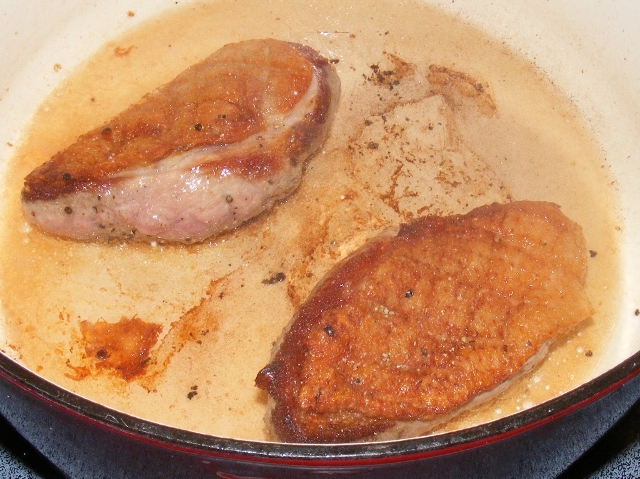 We love duck around here and have tried several versions. Dorie’s are good. This was company-worthy; but as the lady of the house doesn’t eat duck, I doubt I’ll ever make it for anyone but A and me. Looks delicious…I made duck for the Flavors group last week and we loved it, too…definitely going on the menu more often here. I will give this recipe a try next. I will certainly make it more often, although it requires cooking two dishes, as J won’t eat it. I finally got around to making these last night and, like you, I know they will get a repeat as they are so easy and flavorful. My 8 year old came home from school the other day and asked when I was going to make these again! wow, your ducks look great! 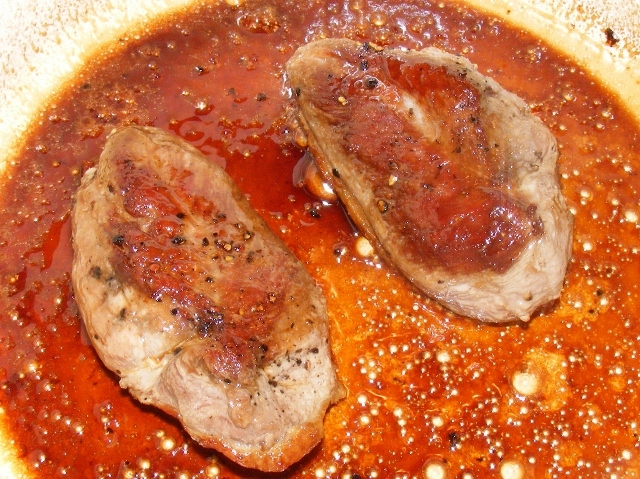 I loved the sauce, I’m going to make the sauce for some pork chops later next week! I saved the extra duck fat from this and confit and used it to make the best omelette I’ve ever tasted! FIrst off, Nana and I were howling with laughter at your comment on our duck “breasts” – too funny ! So glad to see that you tracked some down and can not beleive the price you paid. If I got them at that price I might have actually considered this a new replacement for “pasta with butter” for a quick meal. That said, I see something about “butchering” mixed in that post and I was ashamed at how squeemish I got having to flatten out the cornish hens recently…..so I imagine I will continue to pay a premium for any duck I deal with. Great results- glad you enjoyed this one ! The butchering was actually really easy. You remove the breasts, then cut off the legs and wings. Ducks are mostly skin and fat, so they almost slide apart. I’m not an expert at butchering by any means, but after watching a few videos online, I felt confident enough to tackle the duck. And all went well. So happy to see that you made this one, duck is a favorite at my house and so wonderfully easy to boot. Dorie’s quick pan sauce was also a winner, we will definitely be making it again! My wife doesn’t like duck, but I don’t mind making separate dishes when it means I can have something I love that others in the house won’t eat (duck, lamb, fish). I didn’t get to the soup either (though I made another Dorie soup earlier and will put up the link), since I was out of town all week. Truffle butter turkey… sounds fantastic! I’m roasting a pumpkin for the soup right now. I’ll probably get it made today, but not posted. I’m posting a week behind schedule, but I’ll catch up on rewind week. 4$/ lb – Holy Great Deal, Batman! So what are your plans for the confit??? I made the confit last night and ate half of it standing at the counter. Honest, this is not how I normally eat! I’m not sure what I’ll do with the rest. Maybe a panini on my new press. Glad to hear about the turkey. I can’t wait to make it again!